We’re all about shopping local and supporting the local community. But we also love to hit the road and explore new places around the South. Today, we’re taking you along as we check out some great gift shops at some of the South’s best museums. With more than 35,000 museums in the United States (that’s more than all the American McDonald’s and Starbucks locations combined), as well as online access, it’s easier than ever to ferret out that one-of-a-kind present for the holidays. And the benefits are tremendous. These gifts aren’t ones you simply open and possess; museum gifts open countless worlds to the recipients. And proceeds benefit the museums that in turn offer an array of educational classes, performances and opportunities to the community, as well as helping the local artists whose wares are sold. So see? It all comes back to local after all! Jon Emmitt, curator and manager of the gift shop at The Frist Center for the Visual Arts in Nashville, TN, says, “Relating the merchandise in the shop to what’s in the gallery,” is the most exciting part of his job. While the Frist Center has some consistent merchandise in its store, the bulk of the shop revolves around the changing exhibits that pass through the galleries, as well as locally sourced jewelry, CDs of musicians’ performances at The Frist, pottery and other creations. It’s a treasure trove of spectacular and sound gifts, meaning Jon personally vets every book, all educational materials and every item that relates to the exhibits, ensuring top-quality products. Some museums, such as the South Carolina State Museum, in Columbia, SC, are comprised primarily of standing exhibits, and they actually work with artisans and vendors to create specific items for their shops, according to Scottie Nicholson, gift shop manager. Many pieces in their store reflect state heritage, history, the state bird, flower and more, using jewelry, literature, ornaments and garments as the vessels. But seasonal items are constantly changing, and various open houses offer other discounts to shoppers. While some museums offer online shopping, others, including the South Carolina State Museum, are happy to ship you items you’ve heard about (hint, hint). And don’t forget, while the gift shops rock, membership offers just as much or more. Here are a handful of other museums across the South that just might be the solution to your holiday gift-giving dilemmas. Who doesn’t love the artsy community that is Asheville, NC? The environment, the attitude and the people are truly reflected in the Asheville Art Museum and its gift shop. Members receive a 10 percent discount, and during the holidays, the museum hosts special pop-up shops, featuring jewelry, glass, ceramics and other creations made by local artists. T-shirt and a tie? Find both — and so much more — at the Asheville Art Museum. The tee is $17, and the handmade bow ties, made by local Asheville artist Pam Granger Gale, are $40 each at the Asheville Art Museum. The Birmingham Museum of Art is a nationally recognized permanent collection with more than 24,000 works of art dating from 3000 B.C. to the present. The collections include African, American, Asian, European, Pre-Columbian and Native American cultures. The museum’s Asian art and Vietnamese ceramics collections are considered the finest and most comprehensive in the Southeast, and vary from paintings and sculptures to prints and drawings. Its gift shop reflects the museum’s diverse holdings. This beautiful, hand-carved clutch is created out of finished wood and features a violin shape and gun-metal closure on the outside and black satin lining on the inside. Designed in the United States, the clutch is made in the Philippines in limited numbers. Find it for $225. If you like early Southern culture, decorative arts or the military, America’s First Museum is just for you. The Charleston Museum in South Carolina showcases an outstanding collection that tells the story of the low country. The museum and its historic houses offer a compelling look at the region’s history, complete with artifacts and exhibitions that every Southerner should explore, and a visit to the gift shop is a must, as well. The Charleston Museum gift shop offers a variety of products related to the collections found in the museum. They pride themselves on offering local products, like Charleston Plantation Tea and items from Finkelstein’s Center and Bulls Bay Saltworks. A new item that would make a great gift are coasters featuring depictions of Maria Martin’s butterfly sketches, which were taken from practice sketchbooks donated to and now residing in the museum archives. The set of four can be purchased at The Charleston Museum for $48. Ever-changing installations at The Frist mean an ever-evolving gift shop. Become a member of The Frist Center and earn 20 percent off all gift shop items the day you join. Otherwise, members enjoy a 10 percent discount with every purchase. Here are a few gift items we spotted and love. Wrap up a bit of color and panache this Christmas with a Lindatwist necklace. Every piece artist Linda Hobdy creates is a one-of-a-kind, and there’s no doubt it will be talked about and cherished for years to come. Find it for $89. Lindsey Victoria Thompson, a 2011 graduate of Nashville’s Hume-Fogg High School, wrote the children’s book, Phoebe at the Frist, as her senior capstone project while volunteering in the Frist’s Martin ArtQuest Gallery and Gift Shop and serving on both the Volunteer Advisory Council and Education Council. Her step-grandfather, Walter Knestrick, is the book’s illustrator. Talent clearly runs in the family! Find it for $15. 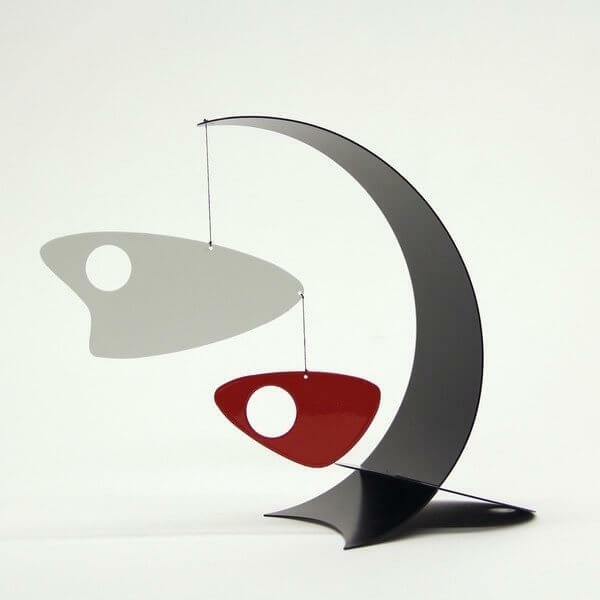 Shoppers with a love of abstract art and clean lines will love this desktop mobile inspired by mid-century design. Find it at the High gift shop for $54 for members, $60 for nonmembers. The Petra Meiren Jewellry line (yes, that’s how the German maker spells it!) runs the gamut from everyday to special occasion options. The line can be found and purchased at the High, and prices range from $90 to $405 for members and $100 to $450 for nonmembers. These earrings are $184.50 for members, $205 for nonmembers. Listed on the National Register of Historic Places and operated by the Atlanta History Center, the Margaret Mitchell House is a turn-of-the century, three-story, Tudor Revival building where Margaret Mitchell lived and wrote her Pulitzer-Prize winning novel, Gone With the Wind. The gift shop naturally features CDs, DVDs and different formats of Gone with the Wind, in addition to some charming collectibles. Scarlett fans, this is your dream! For those seeking a better understanding of race relations, which should include every one of us, the National Civil Rights Museum is a poignant must. This complex of exhibit-filled museums and historic buildings in Memphis, TN, traces the history of the civil rights movement in the United States from the 17th century to today. The Lorraine Motel, the site of Martin Luther King’s assassination, is a part of the complex, and a wreath marks where his life ended. There’s much to learn throughout the property, and the gift shop is where you’ll find meaningful gifts that will make a lasting impact. Tolerance, passion, compassion, kindness … all of these are yours for the taking at the National Civil Rights Museum gift shop. “Boys in the Band” is an upcycled metal work crafted from a 55-gallon metal drum, the creation of which supports village artisans in Haiti. Perfect for indoors or out, find it for $76.99. If you have trouble getting your youngsters to a museum, just tell them The Swan House at the Atlanta History Center was one of many Georgia locations used during the filming of The Hunger Games: Catching Fire. The Swan House is an elegant, classically styled mansion built in 1928 for the Edward H. Inman family, heirs to a cotton brokerage fortune. The mansion, designed by architect Philip Trammell Shutze, offers a peek into the lifestyle of the Inman family during the 1920s and 1930s. Check out the rooms, gardens, terraces and views before you delve into their enchanting gift shop. A wonderful collection of Southern pottery, which starts at $40 and is made in Georgia, always ranks as a best seller at the Atlanta History Center. A variety of books on the South and an extensive lecture series are perfect gifts, along with the tantalizing offering of Southern edibles. Happy travels, happy shopping and the happiest of holidays to you!